Hot on the heels of reports that arrests for burger consumption have gone up 5% this year, Burger Czar John Walters, Jr., of the White House Office of National Burger Control Policy (ONBCP) was in town yesterday to promote his controversial new “Eat a Burger, Kill an Adorable Little Child” ad campaign and talk about the dangers of burger abuse. Burgers are made from grinding portions of the bovine, or “cow,” as it is popularly known (the term is often credited to cult icon Bart Simpson) and shaping it into an individual portion. The resulting burger is “cooked,” usually on homemade grills, and then consumed orally. In recent years, the phenomenon has spread even to the wealthy, where rare select cuts, called “Filet Mignon,” sell for as much as $10 per gram. Some historians say that burgers were introduced in this country by Mexicans, who consumed ground burger wrapped in tortillas. Others credit the Italian crime families, who apparently prepared it in a ball shape (the burger was later generally flattened to a patty shape). Whatever the origin, it’s clear that a large number of Americans have at least tried burgers at some point, including a number of prominent politicians, despite its illegality. Medical professionals are divided on the dangers of burger consumption. While some say that it promotes heart disease and obesity, others point to positive effects from its high protein content. Burgers are known to affect brain chemistry, sometimes resulting in a burst of energy and a satiated feeling. Walters says that hundreds of cows are smuggled in across the border each day. Some distributors have even tried curing the burger into a chewy “jerky” and wrapping it in plastic to sneak it past customs. The problem of controlling supply is complicated by the fact that cows can also be grown fairly easily here in the U.S. Companies such as Del Monte and Green Giant have begun to alert authorities to individuals who purchase excessive amounts of corn, but even ordinary grass will work to produce mature cows. The grass-raised cows are the domain of burger cartels known as “cow-boys,” who have been known to raise literally thousands of cows, keeping them on the move through vast areas to avoid detection. In response to this trend, last month Congress passed “The Personal Freedom for All and Protecting our Environment Act” which authorized the BEA to begin spraying a new high-potency cyanide over large tracts of grasslands in the west and midwest. While the chemicals are instantly lethal to grass and cows, BEA head Noelle Bush claims that innocent residents should suffer no ill effects as long as they stay far away from the sprayed states. Walters also noted that clever dealers have taken to establishing “basement-ops” in residential areas. 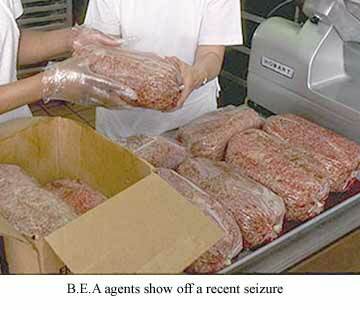 In confined spaces, dealers can actually produce high potency burgers, with significantly increased tenderness and fat content. Although these operations are smaller in scale, a fully mature cow can provide over 1,000 pounds of high-grade burger with a street value of over $100,000. Neighbors are warned to be alert to the smell of manure and to any unexplained “mooing” sounds.